Didn’t They Promise NAFTA Would End Mass Migration? RUSH: We got Bill in Macon, Georgia. You’re next, sir. Glad you called. CALLER: Well, hi, Rush. It’s a great honor. CALLER: Going back to this Honduran march through Mexico, I agree with you that it’s happened a lot in the past, but I think this year and in the future it’s gonna be a little bit more complicated and I think there’s a little bit more, I don’t want say sinister stuff going on, but you remember when Trump was first inaugurated, early 2017, when he and Commerce Secretary Ross started to challenge NAFTA, there was a number of Mexican ministers — I think they were finance ministers, economic ministers. And they point-blank made statements that they were gonna tie the economics of NAFTA to the security and the migration issue. And I think that’s what you’re starting to see now. I think in the past, yeah, it was a bunch of folks coming up, trying to get in, everybody does it the way the Democrats want ’em. But now I think it’s also sort of being a poking by not only Mexico, but also whoever has a dog in the NAFTA fight saying, “Look what we can do, look what we can do. And this is a thousand. What if I send 10,000? What if we send whatever?” And so if you look at it from that level, what you’re gonna have is a very interesting dilemma for President Trump. RUSH: Well, wait a minute. Let me see if I understand. 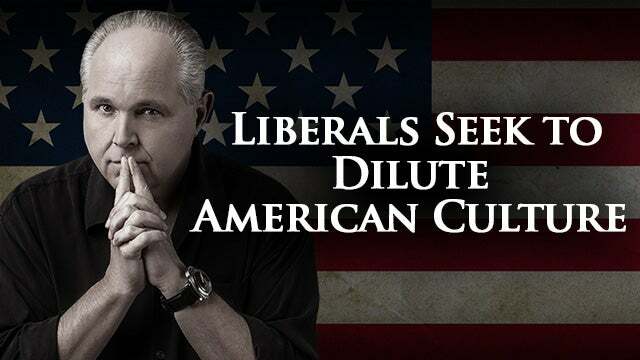 RUSH: You think that the pro-NAFTA people that are that are opposed to Trump changing it, tearing it up, renegotiating it, are taking this action or assisting it, promoting it as their response to Trump’s claims of changing NAFTA or eliminating it? CALLER: I think they’re jumping on the opportunity. I think this march of a thousand would have been there anyway, as you said. But if you go back and look what the actual ministers of Mexico said when the NAFTA issue first came up, they literally — and you can go Google it or whatever you want — they tied events like this to NAFTA, with Trump starting to show that he’s for real, not only with NAFTA, but with the Chinese and starting to worry folks like the U.S. Chamber of Commerce, the issue may have been there, but it is now being played deeper and with other players and there’s more at stake, yes. CALLER: I think they’re taking advantage of it, and I think they’re watching it. And if Trump doesn’t do anything or if Trump blinks, it’s going to be used like North Korea uses the nukes to get things every 10 years or, you know, other countries use. I think they’re using this to poke Trump into an issue with NAFTA. 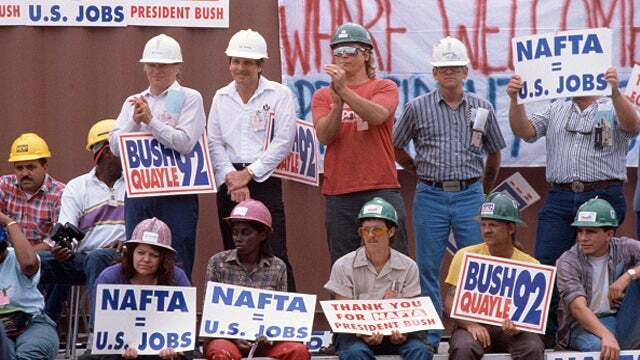 RUSH: By “issue with NAFTA,” you mean a more favorable negotiation with NAFTA? CALLER: Sure. Sure. What are you gonna do? We’re gonna send a hundred thousand Hondurans or we’re not gonna stop anybody and flood your border, that forces Trump to either send the military there, or what happens if they don’t stop? You know? So I think they’re poking Trump. And I don’t think this is started because of NAFTA. Nobody said, “Hey, let’s get these folks and come,” like you say. Every year or so they come. But this year and in the future, while we have this NAFTA thing going on, it’s too good of an issue, too good of a political situation not to be exploited. And if you don’t think that these folks, both the Democrats and the globalists or these, you know, pro-NAFTA folks aren’t gonna use this to get something out of Trump or to make him look bad or to force him to do something that’s gonna make NAFTA renegotiation look bad, that’s too simplistic. I really think that that’s gonna happen. RUSH: So you’re worried that Trump might cave? So I don’t know what Trump will do because he counterpunches differently than anyone else. But I can tell you that the same way — and I hate to go back and, you know, go across the Pacific, but the same way every time North Korea tries to poke with you nukes or somebody else tries to poke you with something to get something out of you, that seems to be what could be happening here. RUSH: Maybe. The one thing that I want to emphasize, however, is that this caravan is an annual thing. This is at least year five of it. And it never has gotten this much attention other than the last couple years the Obama administration, when it was predominantly kids, and it was thought to be purposeful from the Obama administration standpoint as a clandestine, contingent way of getting — I shouldn’t joke — a secretive way of getting young kids into the country under the guise of being compassionate and understanding. It was a flood-the-zone kind of thing. I know what you’re saying. You think this was a response to Trump’s tough stance on NAFTA, it’s a threat, “Okay. You do that, and look what we can do to you.” And then Trump’s counter is to militarize the border however he can legally do it or what have you. You know, the one thing that strikes me about this is if you go back to the original days of NAFTA being negotiated, and I will never forget the No. 1 selling point of the pro-NAFTA people. You know what it was? The primary reason to sign on to and agree with the North American Free Trade Agreement was that it would elevate all of the economies of these Central American countries, including Mexico, and eventually their people wouldn’t want to leave because their economies were thriving and prospering and there would be no reason for them to migrate north. If we would only do NAFTA and open even more free trade lanes, this would redound positively to all of these little economies in Central American nations. And then, by extension, that, of course, would mean less illegal immigration. It hasn’t worked out that way. If we are to believe the people in the caravan and their supporters, all of these countries — Honduras, Nicaragua, El Salvador — are barely hanging on. They’re falling apart. Their economies are nothing. They can’t support their native populations, in which case, then what the hell was NAFTA for? And so Trump wants to tear it up and get rid of it or renegotiate it or more favorable terms. I understand you think this is their way of saying, “You do that, you make this more favorable to the U.S., and we’re gonna destroy you with more illegal immigration.” We’ll see how it plays out. You say Trump’s a counterpuncher. It’s getting to be about that time.